Using railroad cross ties for landscaping is a very cost-effective and resourceful landscaping technique. When railroad tracks close, become damaged or need replacing, the railroad ties are normally sold or scrapped. Using older railroad ties helps to reduce the amount of timber used for landscaping, making this somewhat of a "green" solution for landscaping needs. Obtaining railroad ties can be accomplished by contacting your local railroad company or by contacting the manufacturer of railroad cross ties. You can also scavenge along railroad tracks to look for unused cross ties. Dig a trench along both sides of your driveway. Make the trench as deep as the railroad ties height as it lays flat on the ground. Normally this is about a foot deep. Drill three holes through each of the railroad ties that you place in the trench using a high-powered drill with a half inch spade bit. Drill two holes near the ends and one in the center of each cross tie. Mark where the drill holes are on the side of the ties. Place the railroad ties into the trench in a straight line with all the ties flush together at the ends. Pack the area around the ties tightly with dirt. Stack another row of railroad cross ties on top of the first row. Ensure that you place them on top so that they overlap the seam of the connecting cross ties underneath. Place the top row of ties flush against each other as with the first row. Drill holes through the top row of ties that line up with the holes of the first row. Place steel re-bar into the holes and stake them into the ground with a sledgehammer. This will keep the ties from shifting around. You can pre-drill all the railroad ties before stacking them. This will ease the process. 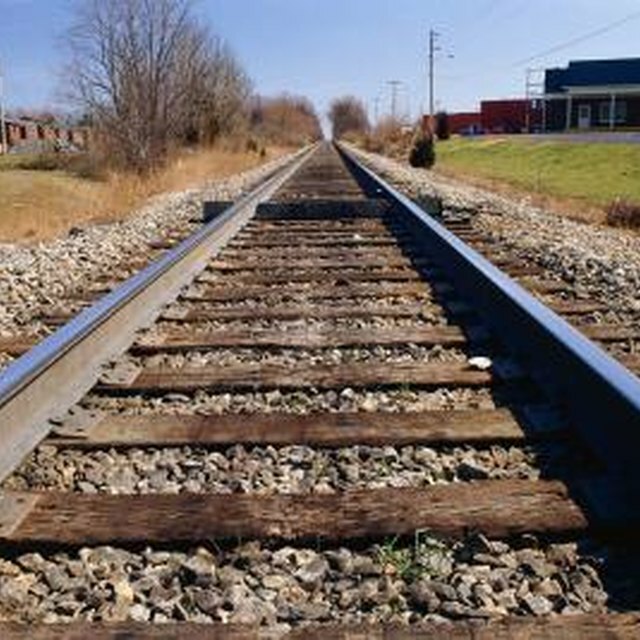 Many older railroad cross ties have been soaked or treated with creosote. This chemical can cause severe skin irritation, so use protective gloves and avoid skin contact when working with older cross ties.